Whether you want to study metabolites, degradation products, bio-fluids, any mass limited samples or just want to conserve sample, these Micro Tubes can be very useful. They are designed for use with reduced sample volumes in cryo/cold probes as well as micro and all standard 5mm probes. The upper portion (body) of the tube is precision 5mm to fit all standard 5mm probes. The body also accommodates the Teflon Adapters used to secure a central capillary to further reduce the sample volume. 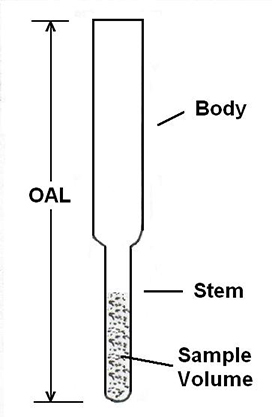 In all cases the narrow sample column eliminates any susceptibility issue. Coaxial alignment is maintained to give the most stable sample column. All volumes are calculated for a 30mm sample height and they are approximate values. Proper filling factors will vary for various probes. Inquire about large quantity prices. To learn more about how Micro Tubes and capillaries can be useful in studying small sample volumes follow the link below. It will take you to a poster describing work completed using these products.